If your kitty chows down her food, she could be swallowing excess air. While somewhat uncommon in kitties, if your feline friend is frequently burping, it's time to visit the vet. Excessive belching in kitties is usually caused by tummy upset and the ingestion of excess air. Your vet can determine the cause for your kitty's embarrassing gas issues, giving her some relief. When your kitty eats, she normally ingests a small amount of air as well. If a cat eats very quickly, the amount of gas ingested increases. This excess air enters the digestive tract and stomach, resulting in belching soon after eating. If the air isn't expelled through burping, it may result in flatulence 15 to 35 minutes after eating. 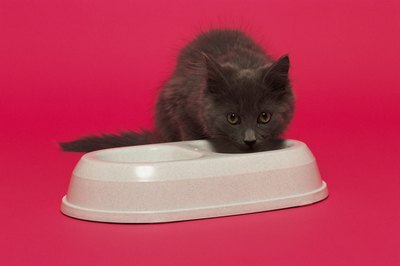 To reduce your kitty's rapid eating, feed her in an area separate from other cats so that she doesn't feel the need to rush through meals because of competition over food. You can also use a special bowl with a raised center, which encourages her to eat more slowly. One of the most common causes of excess gas in your feline friend's system is stomach upset due to the ingestion of spoiled food or food she's allergic to. It may also be due to parasites, hairballs, inflammatory bowel disease, an intestinal obstruction or gastrointestinal cancer. When your kitty's tummy becomes upset, you might notice that it appears distended or makes gurgling noises; she may also experience diarrhea or vomiting. If the symptoms last for more than a day or two, it's time to bring her to the vet to determine what could be the cause of your kitty's frequent burping. Your vet will perform a physical exam of your kitty's tummy, take a blood test and possibly perform some X-rays to determine the cause of her frequent burping. If no medical issues are found, he might recommend switching her to a hypoallergenic diet to rule out a food allergy. A gradual change to a low-fiber food containing a highly digestible protein might also help prevent excess gas due to stomach upset. If she's eaten something toxic that has upset her stomach, activated charcoal may help calm it down. Once any gastrointestinal issue is treated, either with medication, such as an antiparasitic or antibiotic, or surgery, your kitty's frequent belching should stop. Feed your kitty frequent, smaller meals throughout the day to prevent her from ingesting large quantities of food and air. Avoid feeding her milk products because they contain lactose and felines are generally lactose intolerant. Fresh or dried fruits can also contribute to a gassy kitty, so avoid them as well. If your kitty's frequent burping is accompanied with attempts to vomit, she may simply have a hairball. Over-the-counter hairball remedies and cat foods containing ingredients like slippery elm can help your kitty expel the hairball from her system. Daily brushing helps to stop hairballs from forming in the first place. Are Kittens with White Coats Deaf? Is Cat Pheromone Safe for Cats?